Let the Cranbury 24.5 in. W x 22 in. D x 34.25 in. 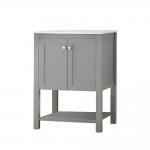 H Vanity in Cool Gray with Ceramic Vanity Top in White with White Basin add a premium appearance to your bathroom. This vanity features a beaded grey finish with a fully finished interior to match. The neutral colors complement most homes and the size is perfect for smaller bathrooms.